Expanding Sheffield solicitors, Taylor&Emmet LLP, has opened its new office in the heart of Rotherham. One of the leading and most successful law firms in the South Yorkshire and Derbyshire region, Taylor&Emmet provides legal advice to business and private clients with current branches in Sheffield, Dronfield and Bakewell. Rothbiz reported last month that office space at the heart of the historic High Street in Rotherham town centre was being readied for the law firm. 15 High Street was previously used by The Source and Barnsley & Rotherham Chamber of Commerce. The investment is part of the local solicitors' ambitious growth plans and takes its number of offices in South Yorkshire and North Derbyshire to five. The new Rotherham office is home to residential conveyancing and family law teams, including mediation and childcare specialists. The firm's full range of business and personal legal services will be accessible, however, as space is available for members of other departments to meet clients by appointment. 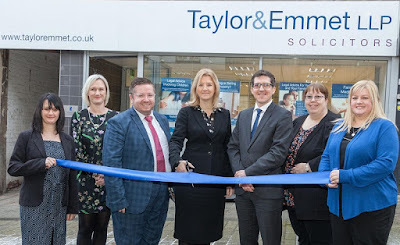 Neil (pictured, third right), who still lives locally, said: "I am excited to be making Taylor&Emmet's unique range of customer-focused legal services available in a convenient location for my fellow Rotherham residents. It is no secret the town centre has faced a number of challenges during recent years, but there seems to be a renewed sense of optimism, following record investment in the borough. I am really pleased we are contributing to its future development."